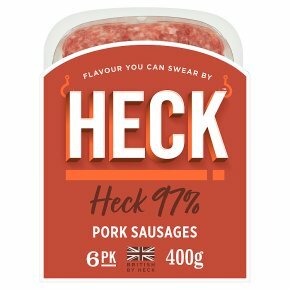 Juicy, lean and bursting with flavour, produced using British pork shoulder. Flavour you can swear by. Small batch, big flavour. Gluten and dairy free. Juicy, lean and bursting with flavour, bed down with rosemary roasties and rich onion gravy. Grill, fry sauté, barbecue, bake - there are many ways to cook a sausage. Remove all packaging before cooking. Cooking intructions are a guide only from chilled.Ensure piping hot throughout before serving. Place under a pre-heated medium grill for 16-20 minutes. Turn occasionally. Pre-heat oven to 190°C / Fan 170°C / Gas Mark 5. Place in the middle of the oven and bake for 25-30 minutes.